b. September 21, 1912, Spokane, Washington, USA. d. February 22, 2002, Corona Del Mar, California, USA. 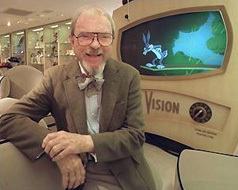 Chuck Jones can be plausibly described as the most influential individual in the history of animated film. 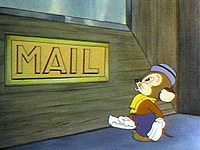 There are other possible candidates for this title, particularly Walt Disney, whose role in developing full animation as integrated industrial/marketing process was certainly decisive for the history of commercial cartoons, providing a nearly universal model (even for those, like Jones himself, who would eventually reproduce the Disney style only in order to parody it). Soon it will also be evident that John Lasseter, the unrivalled pioneer of CGI characterisation, should also be considered for this title. There are yet other possibilities in various contexts (Cohl, McCay, McLaren, Tezuka, Groening). As a creator of globally recognised, intimately recalled, yet highly specific cartoon characters, however, Jones probably has no peer. As directed by Jones, I suspect Daffy and Bugs could punch out Mickey and Donald in any brawl over lasting popular loveability – even if, when this almost happens in Who Framed Roger Rabbit (Zemeckis and Williams, 1988), it seems to be more the Avery version of these characters that is at stake. Jones was not, of course, the pure author of his own fate, no matter how he toyed with the lives of his characters. As he constantly acknowledged, there was a lot of luck involved, as well as quite a lot guidance through osmosis. Above all, Jones was a true child of Hollywood. Although born elsewhere, he was brought up on the Sunset strip, where he was able to absorb fundamental lessons in comic timing from the nearby Chaplin studios, and it was there too, within the protecting yet notoriously porous confines of ‘termite terrace’, that most of his beloved characters would come to life. 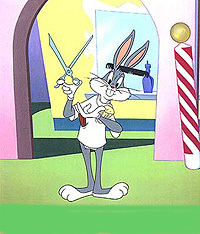 Having gone through the phases of animatic initiation, starting as a cel washer for Ub Iwerks (another candidate for our ‘most important’ title) and learning to animate under Tex Avery, Jones eventually began to direct his own cartoons at Warner Brother’s unkempt animation division (initially a separate company known simply as Leon Schlesinger Productions). Here it is important to note the strange and paradoxical role played by Leon Schlesinger in the history of cartoons. As head honcho of the Warners animation department, Schlesinger nurtured the careers of at least four highly distinguished and distinct auteurs of animation: Freleng, Avery, Clampett, and Jones himself. He did so, however, through the rigorous practice of complete indifference to the art of cartoons, which he viewed purely and simply as a business. Where the Disney style was shaped by the all-reaching (if rarely actually drawing) hands of Walt Disney, the Warner Bros. ‘counter-style’ owes everything to the disinterest and utter disengagement of Schlesinger. The crew at Termite Terrace discovered they could get away with trying anything (including more than one parody of the boss himself). By not giving a hoot, Schlesinger evidently created one of the most inspiring environments in which commercial cartoonists have ever had the privilege to work. The question facing all cartoonists in the late 1930s, Fleischer Studios as well as Warner Bros., was a straightforward one: how to respond to the Disney style of full animation, pioneered at first in such seven-minute classics as The Three Little Pigs (Disney, 1933), the still stunningly colourful Band Concert (Disney, 1935), and the multiplaning The Old Mill (Disney, 1937), and finally be definitively established in the feature-length Snow White and the Seven Dwarfs (Disney, 1937). For the Fleischers it would soon mean the obsolescence of their all-moving, all-pulsating rubber-pipe style of cartoon characterisation (having long ago invented the rotoscope, they would eventually develop a kind of integrated cinematic-animatic ‘hyper-realism’ of their own). It was left to the artists at Warner Brothers, however, (particularly Tex Avery) to intuit that the very technical and moral ‘perfection’ of Disney’s style called out for some kind of direct and militantly disrespectful action in response. The Warner Bros. style became inseparably a parody of Disney’s aesthetic, narrative, and moral proprieties. The rules of squash and stretch would not be ignored, but made to serve quite different purposes. The bodies of Bugs and Daffy are no longer jointless, they suggest mass, gravity, skeletal structure. But different things are transpiring in these forests. Bambi delivers a weighty lesson on the finality of death and the need for duty; Bugs just keeps on sending Daffy’s beak spinning ineffectually around his head, before the whole natural order is inverted and both of these anthropomorphised animals directly address the audience “be vewy, vewy qwiet …. we’re hunting Elmers” (Jones’ Rabbit Fire, 1951). Initially, however, Jones, much more than any of his colleagues, allowed himself to be seduced by the techniques and moods of Disney cartoons. His early Sniffles cartoons, with their rounded, innocuous forms and their pastoral, pastel tones, suggest a kind of voluntary apprenticeship in the disciplines of unrestrained ‘Disneyism’. Thankfully, the ‘fidelity’ displayed by the young Jones is soon deflected under the influence of the pointed exaggerations, sexual aggressions and double-takes of Avery, as well as the elaborate psychodramas and animated gedanken experiments of Clampett. 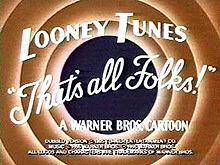 If the explosive, accelerated, ballistic style of Tex Avery could be described as a species of commercial ‘futurism’, and the deliriously introspective, speculative worlds evoked by Clampett are forms of mass ‘surrealism’, Jones’ characterisations probably demand a more literary analogy (interestingly, the young Charles M. was withdrawn from high school and sent to Chounard Art Institute precisely because his literary tastes were far in advance of his classmates). 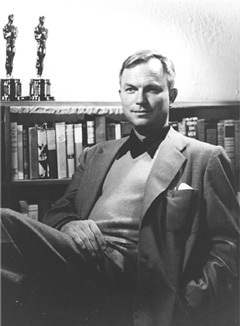 There is more than a touch of Kafka and the ever-persecuted ‘K’ in the almost anonymously named ‘Chuck Jones’. In the universes created by each of these two figures of international modernity, each unrivalled in his own field of experimentation, characters constantly seem to be summoned forth in order to manifest and testify to nothing but the already ordained futility of their actions. There will certainly not be room to enumerate the many elements of Jones’ irreducible style as an animatic auteur, let alone the implications of the ‘whole’ that emerges through and across all the singular experiments in characterisation that comprise his life’s work. Any such definitive analysis, however, would need to respond, at the very least, both to his at once ‘avant garde’ and hard-headedly commercial use of abstracted, deliberately over-stylised backgrounds and movements, and to the logical circularity which repeatedly dictates the emotional lives of his characters. In Aristo Cat (1943), a cartoon that is, sadly, rarely seen on Australian television screens, Jones turns the background architecture into a direct and intense externalisation of a character’s degenerating mental state. The lines of the wallpaper become the prisons bars of his inner madness, he is persecuted by design. At the level of economising movement, Jones is often misleadingly said to have invented ‘limited animation’ in The Dover Boys (1942), through the use of ‘smear drawings’ to evoke speed and sudden movement. If ‘limited animation’ refers to the standardised and abbreviated techniques of television cartoons (probably ‘invented’ by Hanna and Barbera for the very appropriately named Ruff and Ready show), then nothing could be further from the truth. Jones deliberately ‘limits’ animation here at one level, but for an entirely comic-aesthetic purpose. In one character, the decision not to ‘fully animate’ the body successfully evokes the form-stretching eagerness of a teenage boy. The character seems to go into a kind of ‘warp drive’ through the sheer power of enthusiasm, making space itself bend to his will. Far from limiting animation in any impoverishing sense, Jones here explores the full palette of animated possibilities, including those which do not involve ‘full animation’ in the technical sense. 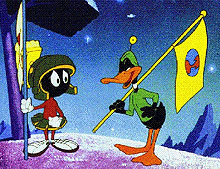 Another Jones cartoon that displays the virtues of extreme stylisation – this time one that Australian viewers should know very well – is Duck Dodgers in the 24½ Century (1953), especially in the gleaming, floating, plasticised constructions of the space port (an experiment in design taken even further when Bugs and Marvin fight over a ‘space modulator’ in another cartoon). It is perhaps this virtue of simplified space which Porky celebrates when he dismisses Daffy’s torturous computations using a space-navigo compass, pointing out that ‘planet X’ is just one letter in a plainly visible alphabet structuring the entire galaxy. There is something very instructive here, also, in the tightly integrated series of futilities and inversions that determines Daffy’s trajectory throughout the adventure. Who could ever forget the successfully disintegration-proof vest that just happens to leave Daffy’s entire bodily substance pouring out of its interior like so much moondust out of a sieve, or Daffy’s not-so-surprised exclamation when his ‘disintegrating pistol’ does the only thing the laws of Jones’ Kafkaesque syntax could possibly allow? (Viewers interested in Jonesian semiotics may wish to further research the question of pronoun trouble.) 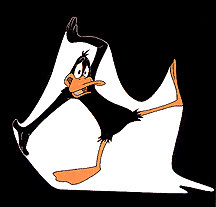 But Daffy isn’t alone in his ever-ironic fate, he just happens to strain against it with a manic and loveable stupidity matched by few other characters (except, to be sure, Wil.E Coyote). It is not just the duck, after all, who ends up clinging to a root in empty space at the end of Duck Dodgers, but Marvin and Porky, too. It is left to Porky to pronounce the telling ‘b-b-b-big deal’ that provides this cartoon’s parting note. An adequate study of the complex processes of cross-fertilisation and mutual modulation that led to the ‘parallel yet differentiated development’ of such seemingly eternal characters as Bugs and Daffy at Termite Terrace is yet to be carried out. Whatever the secret of the special chemistry that prevailed for a time at Warners, however, it was evidently not to be found by Jones at MGM (a transition earlier made with great success by Avery), when he was conscripted to direct the already successful Tom and Jerry series. This sojourn proved to be neither happy nor fruitful. More than once, Jones testified that he wouldn’t even know how to begin making films ‘for children’, or, indeed, for any anticipated market. He could only animate for himself. He was quite candid in admitting that each of the characters invented purely by him (such as Pepe Le Pew, Marvin the Martian, Wil.E.Coyote and the Roadrunner), as well as each of the characters inherited and developed by him in new directions (Daffy, Bugs, Elmer, Porky), embodied either some despicable neurosis or some impossibly noble aspiration extracted from his own experience. In Tex Avery’s hands, by contrast, Daffy and Bugs seemed like differently outfitted vehicles for the release of one, all-consuming, tumescent life force. Directed by Jones, these same characters become perfectly and permanently opposed personality types. Bugs becomes the initially reluctant agent of a gracefully vengeful justice, one that is paradoxically enforced through the suspension of all apparent laws; Daffy becomes an ego in search of a character, a figure of futility, a virtual tissue of ‘issues’. Jones’ characters were thus designed knowingly as virtual avatars of his own unknown life: their possibility was usually found in some intimate impossibility he would discover within himself, some fragment of himself that he would see escaping himself in the mirror. Do I risk stretching things too far (like some naive native dog tugging on an Acme rubber band), if I say that the whole ‘family’ of these characters seemed to constitute a kind of personalised universe for Jones, and that this universe effectively ‘took care’ of matter itself for him, displacing his passions from the level of merely ‘real’ or ‘physical’ existence? Every animator is, at least potentially, a cosmocrator, a master of his own virtual universe, an all-powerful creator-destroyer, and Jones seems to have been particularly (and ironically) aware of this (and not only in Duck Amuck, when Bugs the cartoon-director invisibly plays out his worst tendencies upon the flat body of poor Daffy the cartoon-actor). Any fair treatment of Jones’ work would need to account for the input of his most lastingly sympatico writer, Mike Maltese. Any such treatment of the development of Bugs Bunny and Daffy Duck as characters would need to recognise the often unexpected and formative role played by the voice artist, Mel Blanc (especially in the case of Bugs). Finally, any adequate analysis of the development of the Warner Brothers’ style as a whole would need to underline the singular musical inventions of Carl Stalling. Cholodenko, Alan, ed., The Illusion of Life: Essays on Animation (Sydney: Power Publications in association with Australian Film Commission, 1991). Jones, Chuck, Chuck Amuck: The Life and Times of an Animated Cartoonist (New York: Avon, 1989). Klein, Norman M., Seven Minutes: The Life and Death of the American Animated Cartoon (London: Verso, 1993). Lenburg, Jeff, The Great Cartoon Directors (North Carolina: McFarland, 1983). Maltin, Leonard, The Disney Films, Third ed. (New York: Hyperion, 1995). Wells, Paul, Understanding Animation (London and New York: Routledge, 1998). Official website with news, his famous characters, gifts, contacts, the Chuck Jones Foundation, spotlight art and a calendar. Features a filmography, links, press release and recorded interview. Features an interview with Jones by Stephen Thompson. Fun, noisy fan page, very much in the spirit of Jones’s work. General overview of Jones’ work. Fan site by Don Markstein. Chuck Jones, quoted in Wells, Understanding Animation, p. 40. Jones, Chuck Amuck, pp. 263-4.